Our 2018/2019 Season is ended. 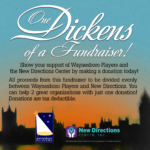 Thank you for supporting the Waynesboro Players! All seats are general seating. Doors open one hour prior to showtime. For the best seats please come early. When purchasing tickets online, your tickets will be mailed to you if you purchase them at least two weeks prior to opening night. Please bring your PayPal receipt to the box office for proof of purchase if you purchase tickets less than two weeks prior to the show. Ticket sales are processed by PayPal, but you don’t have to have a PayPal account to purchase. Please print your PayPal receipt and bring it to the box office as your ticket. ← Audition Announcement for Addams Family the Musical!